Why are sports important in child development? Sports are not just about the trophies. They help children have an outlet outside of school where they can socialize, learn something new, learn to be motivated, organized, and disciplined, exert energy, and get exercise. The number one reason that children enjoy sports is because sports are FUN! On top of all of the positives, lies the heap of responsibility on the shoulders of the sports parent; getting kids to practice on time, paying for lessons and equipment, scheduling things around practices/games, preparing things if the children are young and have not perfected their organizational skills, being the ultimate Uber to and from practice and last but not least, being the finest gourmet chef once we finally arrive home. This can be overwhelming, but we do it, we smile, we enjoy it, and we are always there. Is it worth it? YES. My favorite things about sharing a love for the same sport as my child is the awesome time we get to spend together bonding over the sport. I grew up being a tennis kid, and my mom was the ultimate tennis mom, who has now been upgraded to being the ultimate tennis grandma! Tennis has changed my life and has put me through college. To watch my son be so dedicated, obsessed, and in love with the same sport that I had a passion for growing up is something that I cherish. His love for the sport surpasses mine and I facilitate his love for that sport by being everything that he needs me to be in a sports mom. Tennis is a tough sport as it is, but to go pro, you really need to connect the right dots. It all starts with finding the right coach that fits your child's needs personality wise, and skill wise. I have been fortunate to find my son the perfect team over at his tennis academy that monitors his progress, fine tunes his skills, understands his needs...and they care! 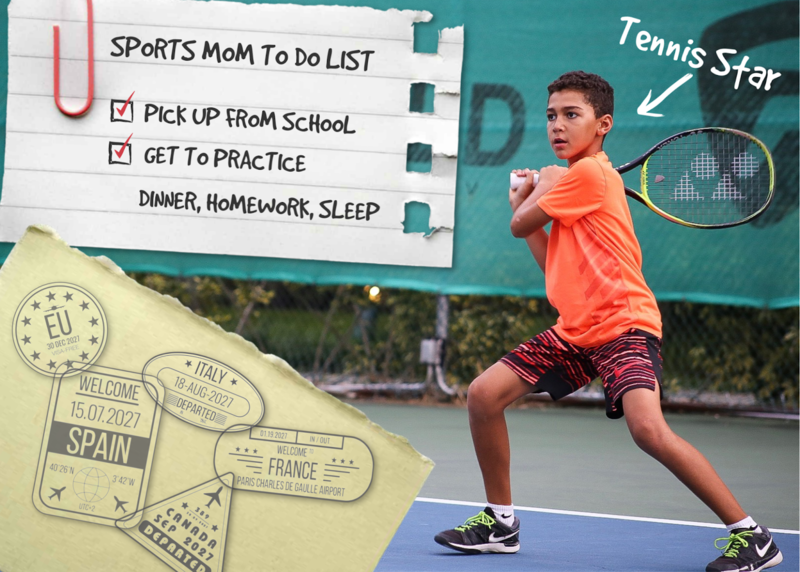 I will be sharing more of my son's tennis progress here with you all as he continues his journey to make his tennis dreams come true. I will be the best sports mom that I can be for my son, and I wish all of my fellow sports moms/dads a position filled with love, support, health...and many full tanks of gas!